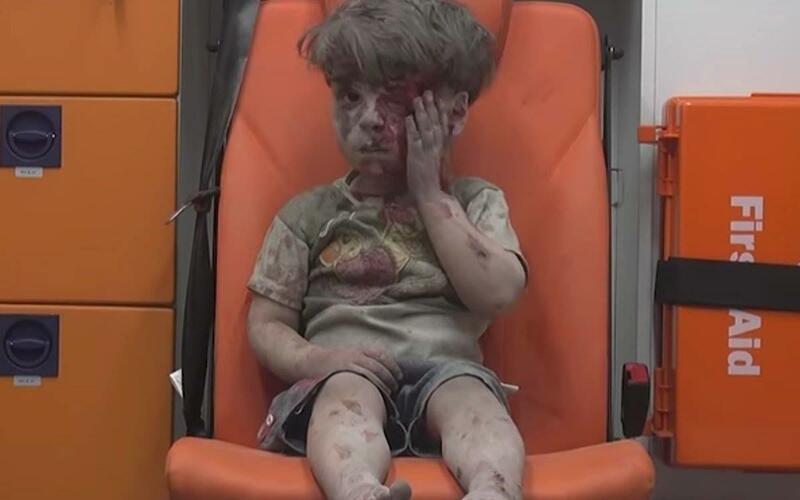 This is Omran. Omran is 5 years old. He survived a Russian airstrike in Aleppo. But his 10 year old brother, Ali, did not. and Russia kill children, and hit hospitals and schools. Right now civilians in Syria are living under hundreds of airstrikes every day. Such an intensity of attacks cost a lot of money. For the first time ever we have a bill that would place sanctions on those fueling these deadly attacks. If we can pass this bill we can reduce the number of attacks each day and literally save lives. Of course sanctions alone won't stop these attacks but this bill also means that the US Administration has to look into the technicalities of what a US humanitarian intervention could look like -- essentially how the US can end these attacks. We have just have a few months to pass this bill before a new administration. With your support we can force the next White House to study the feasibility of a safe zone or a ﻿no-fly zone﻿ in Syria to protect civilians from aerial attacks. sanctions could be placed on those who targeted Omran & Ali? ON THOSE WHO FLEW THE JETS? ON THOSE WHO SOLD THE FUEL? WITH YOUR SUPPORT, THEY CAN BE. Please email your representative through this link to ask them to cosponsor the bill. Call your representative through this link and ask for a meeting to discuss why they should cosponsor the bill. Attend one of two advocacy days in Congress to ask your members to support this bill on September 15th in Washington D.C. You can do that through the form below. The bill is named after"CAESAR"
a defected military photographer who smuggled out 53,275 photographs showing evidence of war crimes. After viewing the photos and hearing his testimony, the House Foreign Affairs Committee introduced this bill. The Caesar Syria Civilian Protection Act of 2016 (H.R. 5732) is a bipartisan bill which broadens sanctions on those who perpetrate human rights violations in Syria and calls for the President to consider civilian protection measures to stop indiscriminate attacks on civilian areas and the deliberate targeting of hospitals, schools, and places of worship. Introduced last month, the Caesar Civilian Protection Act is the most meaningful step taken by members of the US Government since the surfacing of the Caesar photos. This humanitarian legislation will impose sanctions on any individual in the world who enables the Syrian government’s torture and indiscriminate bombardment of Syrian civilians. On a practical level, the Bill translated into impeding access to military equipment, spare aircraft parts, fuel, and funding that the Syrian Government relied on to attack innocent men, women, and children. YOUR ADVOCACY IS CRITICAL in advancing this legislation on Syria, which will not only help save Syrian lives, but will also demonstrate to the worst human rights violators that there are actual consequences for their continued crimes. The time for words is over. Now is the time for action.